Free shipping to United States with $50 purchase from PatriotCoinRing. See item details below for sale terms. Not only is it silver but this is a very rare coin and because of its scarcity there are a ton of fakes circulating out there. Typically 3 out of 4 coins ordered turn out to be fake which is really hard to detect until I've actually punched a hole in the center to turn it inside out. If it's real silver it'll come out perfect but the 75% of the time I find it's made of Zinc Alloy when it splits in half making this ring all the more expensive for me to make. 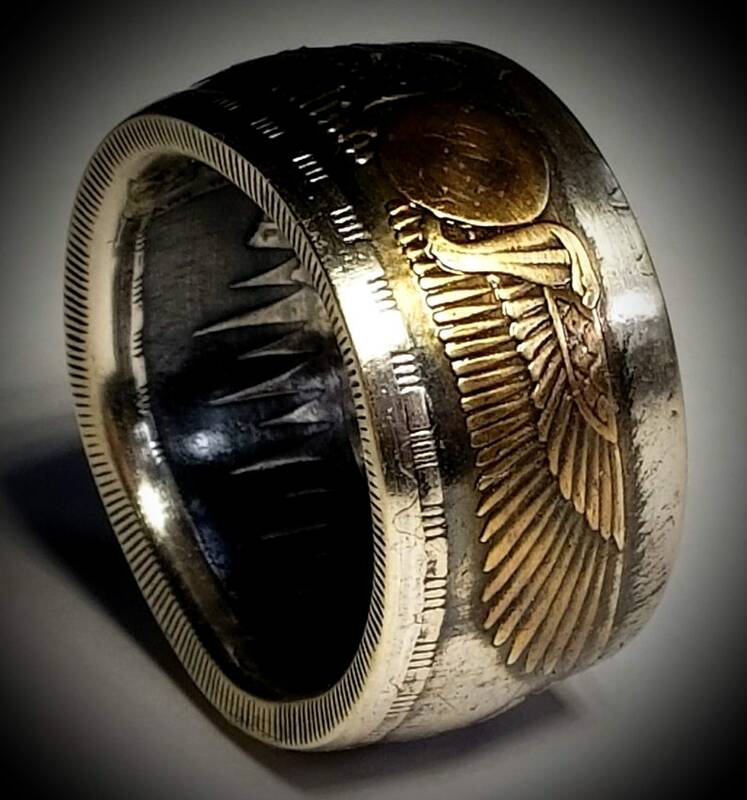 If you purchase this ring I assure you it is 100% real and not a fake but the scarcity of finding this coin is what puts it on the pricey side however if you're the type who can appreciate having a really rare authentic coin converted especially for those wanting to where something of heritage, then this is an extremely popular ring to have! After being asked to task the job of finding the best Egyptian coin possible to convert into a coin ring I found this beautiful Egyptian 25 Qirsh Piastres (1376) 1955, 1956 or 1967 .720 Silver coin. What really stood out for me was the popular Egyptian Sun Wings and Cobras as popular as the scarab in the Egyptian culture, this was a massive part of Egyptian art history. Just as nice I found it came in the perfect size of 35mm in diameter and 17.5g of .720 Silver weight meaning it wasn't too heavy and yet not super thin or too light neither. What I didn't realize was how hard it would be to find these coins as they are extremely scarce however I was able to get my hands on only a half dozen. On the first couple bands I made and experimented with I made one in a thin band cut at only 10mm wide compared to the widest at 14mm wide. Unless otherwise instructed I would choose the proper cut for your size ring but feel free to let me know if you prefer a thin or wide band and I'll certainly do what I can. When ordering, be sure to not that the photos above are of the wide cut with a two tone silver and antique patina finish then the sun wings plated in 24k Gold and given another layer of antiquing (a very difficult process to do both). It's finally sealed in a jewelers clear coat to help protect the finish and plating of the band although I'd highly recommend an inexpensive bottle of jewelers finish for yourself so you can reapply it once a month or as needed as it starts to wear away just to ensure longevity of your bands beautiful finish. The small individual use bottles can be found here and each will last about a year on average. - Precious Metals: 24k Gold, 999 Silver, Platinum, Rose Gold, White Gold, Rhodium and more! - If you want the same exact finish as you see in the photos above, you'll find this in the options section to your right that says "GOLD SILVER ANTIQUED". This is a very very long process that takes almost an entire day to make and is the reason it is so much more expensive than the other options. Were you aware that buying a ring from us helps our disabled vets? A portion of all proceeds are donated to the Wounded Warrior Project and as a fellow veteran myself, I thank you for your support of both small business and helping wounded vets get back on their feet again after returning home from war in the protection of our freedom to continue moving forward in life and get their much needed medical and financial needs met. God Bless you and God Bless America! Mission: The mission of Wounded Warrior Project (WWP) is to honor and empower Wounded Warriors. Our vision is to foster the most successful, well-adjusted generation of wounded service members in our nation's history. Get 15% off your order when you spend $100 at this shop. Discount shown at checkout. 2010 SHAWNEE TRIBE "Trail Of Tears" 1oz Silver Proof Coin converted into a beautiful Ring! with all purchases $50 or more. i waited anxiously, took a little over a week to receive it but once i got it, it was made exactly as it should have been made. I love this ring. I own many rings but this one takes the cake. God Bless! It’s awesome. I love it! Absolutely gorgeous! Exactly how I pictured it. As a prior army brat I am always going to support vets! Thank you for your service and your great craftsmanship! Ring is perfect. Excellent craftsmanship. Thank you! 1 Troy oz. .9999 Pure Silver Memento Mori (Day of the Dead) Celebration Coin Ring. Day of Remembrance for loved ones and to Cherish Life!